We do not know who tried to kill former UK-Russia double agent Sergei Skripal and his daughter, Yulia, assertedly by a nerve agent, Novichok, and the UK refuses to supply Russia with a sample of the agent for analysis. However with stunning hypocrisy and mendacity the UK, US, Australia and the US-allied EU have been quick with confected outrage to blame Russia for an attempted murder on British soil, ignoring the millions who have died in UK, US and US Alliance attacks on other countries in recent decades. Notwithstanding this headline-grabbing, US Alliance outrage, it remains just as likely that the Skripal Affair is another US Alliance false flag operation conducted by the UK, the US, Apartheid Israel or whoever for whatever reason, noting that culprit has not been identified, the agent has not been independently confirmed, the UK rejects any Russian involvement in such analysis, and the site of the attempted murder, Salisbury, is only a few kilometres from the UK’s top secret, chemical warfare facility, Porton Down . As a biological chemist who has published a huge pharmacological book on the molecular sites of action of bioactive compounds  and numerous scientific papers on mass spectrometry-based determination of the primary structure of bioactive proteins , I would opine here that rigorous identification of the Skripal Affair active agent(s) and their origins would require samples of the agent(s) from the victims and of the suspected agent from available sources . Of course the murder or attempted murder of any individuals by agents of a foreign power is an outrage but vastly more so is the active and passive mass murder of millions of people as exampled by the death of 32 million Muslims from violence, 5 million, or deprivation, 27 million, in 20 countries invaded by the US Alliance since the US Government’s 9-11 false flag atrocity that killed 3,000 [5, 6]. 9-11 was used as the excuse for an endless US War on Terror that in horrible reality is an ongoing Muslim Holocaust and Muslim Genocide  but not recognized as such by endlessly lying Mainstream journalist, politician, commentariat and academic presstitutes [7-10]. The Russophobic assertions of the UK, US and US Alliance in the absence of hard evidence are reminiscent of the utterly false, warmongering assertion of “Iraqi Weapons of Mass Destruction” (WMD) that was used as the excuse for the 2003-2011 US, UK and Australian invasion and devastation of Iraq in which 2.7 million Iraqis died from violence, 1.5 million, or from war-imposed violence, 1.2 million, and 5-6 million refugees were generated ) [11, 12]. Indeed the US Center for Public Integrity estimated that the Bush Administration uttered 935 falsehoods about Iraq between 9-11 and the invasion of Iraq . Similarly, the war criminal devastation of Libya by the France, UK and US (FUKUS) Alliance killed 0.1 million through violence, killed a further 0.1 million through deprivation, and generated 1 million refugees in what was Africa’s most prosperous country. This deadly “violation of sovereignty” was based on the hypothetical assertion that Libyan leader Gaddafi would “massacre” huge numbers of Libyans (in reality the FUKUS Alliance including the UK Tory Government did the massacring) . Ditto the ongoing Afghan Genocide ( 5.6 million Afghan deaths from violence , 1.4 million, or imposed deprivation, 4.2 million, and 3 million refugees) despite no Afghans being involved in the 9-11 atrocity according the “lying Bush official version of 9-11” [12, 14]. Indeed in an Al Jazeera interview, US-installed former Afghan President Hamid Karzai stated (10 September 2015): “[Al-Qaeda] is for me a myth […] For us, they don’t exist. I don’t know if al-Qaeda existed and I don’t know if they exist. I have not seen them and I’ve not had any report about them, any report that would indicate that al-Qaeda is operating in Afghanistan… [re the 9-11 “official version”] That is what I have heard from our Western friends. That’s what the Western media says. There is no doubt that an operation, a terrorist operation was conducted in New York and in Washington… I neither believe nor disbelieve something that I don’t know about. I can tell you that Afghanistan was as much a victim of terrorism as was America, as were the people who were killed in the September 11th terrorist attacks” . Theresa May (UK PM) speaking to the House of Commons : “Based on the positive identification of this chemical agent by world-leading experts at the Defence Science and Technology Laboratory at Porton Down; our knowledge that Russia has previously produced this agent and would still be capable of doing so; Russia’s record of conducting state-sponsored assassinations; and our assessment that Russia views some defectors as legitimate targets for assassinations; the Government has concluded that it is highly likely that Russia was responsible for the act against Sergei and Yulia Skripal. Mr. Speaker, there are therefore only two plausible explanations for what happened in Salisbury on the 4th of March. Either this was a direct act by the Russian state against our country. Or the Russian government lost control of this potentially catastrophically damaging nerve agent and allowed it to get into the hands of others” . Comment: Other “plausible explanations”, backed by circumstantial evidence, extensive track records of lying and killing, and Means, Opportunity and Motive (MOM), could involve the UK, US, US Alliance, Apartheid Israel or indeed US lackey Australia, all of which have appalling records this century of invading other countries and lying about the deadly consequences of the ongoing, US-led Muslim Holocaust and Muslim Genocide [5, 11-15] . Over the last millennium the British have invaded the territory of 193 present-day countries – nearly every country on earth – as compared to Australia 85, France 82, the US 72 (52 since WW2) , Germany 39, Japan 30, Russia 25, Canada 25, Apartheid Israel 12, China 2 and North Korea arguably zero [ 17-23]. In this century alone a nuclear terrorist UK in cahoots with a nuclear terrorist US has devastatingly invaded some 4 countries (Libya, Iraq, Syria, Afghanistan and Pakistan) and continues to use illegal drone attacks in these countries . One notes that before devastation of Libya by the France-UK-US (FUKUS) Alliance, Libya was the most prosperous country in Africa. Under Theresa May, the UK through arms sales and diplomacy is deeply complicit in the Saudi-led Yemeni Genocide in starving Yemen..
Theresa May is guilty of stunning hyperbole in waxing hysterical over the unproven attempted murder of one (1) Russian double agent by a non-explosive chemical weapon while ignoring UK and US complicity in the active and passive mass murder of millions of Muslims in this century alone through invasions of national sovereignty involving explosive chemical weapons. This astonishing and massive lying by omission recalls the notion of the Big Lie put forward by Nazi leaders Joseph Goebbels and Adolph Hitler that people (and especially the English) will accept Big Lies on the basis that surely people would not have the gall to invent them i.e. ordinary folk commonly tell small lies but would be ashamed to resort to massive falsehood. . Thus Goebbels: “The essential English leadership secret does not depend on particular intelligence. Rather, it depends on a remarkably stupid thick-headedness. The English follow the principle that when one lies, one should lie big, and stick to it. They keep up their lies, even at the risk of looking ridiculous” . The English Establishment has been lying by commission and omission for a millennium. Thus by way of example, while the WW2 Jewish Holocaust (5-6 million killed through violence or deprivation) is used to justify the genocidally racist Zionist colonial enterprise and the resolutely ignored, ongoing Palestinian Genocide , the British resolutely ignore the contemporaneous but “forgotten” WW2 Bengali Holocaust (6-7 million Indians deliberately starved to death by the British with UK lackey Australian complicity) [27- 29] and the 2-century Indian Holocaust in which 1,800 million Indians died avoidably (prematurely) from sustained, deliberate, and egregious British-imposed deprivation . Angela Merkel, Emmanuel Macron, Donald Trump, and Theresa May, the leaders of the Germany, France, the US and the UK, respectively, released a joint statement: “[We] abhor the attack that took place against Sergei and Yulia Skripal. A British police officer who was also exposed in the attack remains seriously ill, and the lives of many innocent British citizens have been threatened. We express our sympathies to them all, and our admiration for the UK police and emergency services for their courageous response. It is an assault on UK sovereignty and any such use by a state party is a clear violation of the chemical weapons convention and a breach of international law. It threatens the security of us all. The United Kingdom thoroughly briefed its allies that it was highly likely that Russia was responsible for the attack. We share the UK assessment that there is no plausible alternative explanation, and note that Russia’s failure to address the legitimate request by the UK government further underlines its responsibility” . Comment: It is just as “highly likely” that the endlessly invading and lying UK, US or US Alliance (including Apartheid Israel) were responsible for the attack by persons presently unknown, noting the UK’s “failure to address the legitimate request by the” Russian government for samples for analysis. The US, Germany, France and the UK have appalling records this century of invading other countries and lying about the deadly consequences of the ongoing, US-led Muslim Holocaust and Muslim Genocide [5, 11-15] (see comment under item #1). The US in its dirty, 242-year history has invaded 72 countries (52 since the end of WW2) [18-20] , has an appalling record of state terrorism and “false flag” atrocities used to justify imperialist wars from the Spanish-American War to the post-9-11 War on Muslims [5, 6, 17, 32], and presently has nearly 800 military bases in more than 70 countries as compared to the UK, France and Russia that together have about 30 foreign bases combined [33, 34]. Indeed the worst crime of jihadi terrorists (all essentially US-engendered whether US-backed or not) is that their evil violence is used as an excuse for disproportionately huge devastation of Muslim countries by the US Alliance. One notes that the mendacious and genocidally violent US Alliance has repeatedly used alleged “chemical attacks” as an excuse for more deadly interventions in the ongoing Syrian Genocide . The major US Alliance countries no doubt possess toxic war chemicals if only for analytical reference purposes (as surely revealed for the UK in the Skripal Affair). Germany has historically invaded about 39 countries, mostly during the Nazi era of the 1930s and 1940s , but in the 21st century Germany had a limited involvement in state terrorism and non-conventional Weapons of Mass Destruction. Thus an ostensibly “liberal” but actually democratically neo-Nazi Germany has been involved in the ongoing Afghan Genocide [14, 17] and supplied 5 submarines to Apartheid Israel that are now armed with nuclear weapons and threaten not just Iran but the whole world . France has an appalling historical record of genocidal invasion of 85 other countries that has continued into the post-WW2 era and the 21st century. Now peoples subject to occupation or indeed neocolonial hegemony suffer from considerable avoidable death (excess death, premature death, untimely death) that can greatly exceed violent deaths from military activities. Thus 1950-2005 avoidable deaths from deprivation in countries it has occupied in the post-WW2 era total 142 million for nuclear terrorist France as compared to 727 million for the nuclear terrorist UK, 82 million (for the nuclear terrorist US), and 24 million (for nuclear terrorist Apartheid Israel) [17, 37]. In the 21st century a neofascist, New Vichy France has deployed military forces in a swathe of 14 Muslim countries from Mali to Afghanistan , and in terms of deaths these are infinitely more deadly “violations of sovereignty” than the attempted murder of Sergei Skripal by persons unknown in the UK. .
EU foreign ministers issued a statement supporting the UK position: “The European Union strongly condemns the attack that took place against Sergei and Yulia Skripal in Salisbury, UK on 4 March 2018, that also left a police officer seriously ill. The lives of many citizens were threatened by this reckless and illegal act. The European Union takes extremely seriously the UK Government’s assessment that it is highly likely that the Russian Federation is responsible… “The European Union is shocked at the offensive use of any military-grade nerve agent, of a type developed by Russia, for the first time on European soil in over 70 years. The use of chemical weapons by anyone under any circumstances is completely unacceptable and constitutes a security threat to us all. Any such use is a clear violation of the Chemical Weapons Convention, a breach of international law and undermines the rules-based international order. The EU welcomes the commitment of the UK to work closely with the Organisation for the Prohibition of Chemical Weapons (OPCW) in supporting the investigation into the attack. The Union calls on Russia to address urgently the questions raised by the UK and the international community and to provide immediate, full and complete disclosure of its Novichok programme to the OPCW” . Donald Trump (US president) was initially cautious: “As soon as we get the facts straight, and we’re going to be speaking with the British today, we’re speaking with Theresa May today, and as soon as we get the facts straight, if we agree with them, we will condemn Russia or whoever it may be”  but then signed up to a joint US Alliance statement dishonestly blaming Russia in the absence of definitive proof (see #2 above). Comment: Historically the US has invaded 72 countries (52 since WW2) as compared to the British 193, Australia 85, France 82, Germany 39, Japan 30, Russia 25, Canada 25, Apartheid Israel 12, China 2 and North Korea arguably zero (can a country invade itself?) [18-20]. In the 21st century alone the US Alliance has invaded 20 countries in an ongoing Muslim Holocaust and Muslim Genocide in which 32 million Muslims have died from violence, 5 million, or from deprivation, 27 million, since the US Government’s 9-11 false flag atrocity [5, 6]. Under the Trump presidency the US has violently invaded the territory of 7 countries, specifically Libya, starving Somalia, starving Yemen, Syria, Iraq, Afghanistan and Pakistan, and threatens to annihilate Iran and North Korea. What hypocrisy for Trump to blame Russia in the absence of definitive proof for invasion of UK sovereignty in the Salisbury attempted murder of an individual while participating in the routine violent violation of the sovereignty of 7 long-suffering countries. Julie Bishop (Foreign Minister of pro-war, pro-Apartheid, US lackey Australia) : “There is no other explanation, no other plausible explanation, as to where this nerve agent came from [Russia]. Either Russia was behind the attempted assassination or it has lost control of this previously undisclosed stockpile of nerve agent. Russia is a party to the chemical weapons convention and under that chemical weapons convention, all chemical weapons should have been declared and it would appear that this nerve agent has not been declared. There are obligations on Russia to get rid of any chemical weapons — and most certainly it should have declared what it was doing with this program… Under the chemical weapons convention, one state that suspects another state of having illegal chemical weapons can seek these inspections and Britain certainly has the right to do that, and they are aware that we would support them, should they go down that path” . Comment. As UK lackeys or US lackeys Australians have invaded 85 countries . After the Japanese Pearl Harbor attack in December 1941 Australia shifted from being a UK lackey to being a US lackey, while retaining close toes with serial invader Britain. Australia was complicit in all post-1950 US Asian wars, atrocities associated with 40 million Asian deaths from violence or war-imposed deprivation . In the 21st century Australia joined the UK and US in illegally invading Iraq and joined in the US-led Afghan Genocide. Presently Australia has forces operating in Syria, Iraq and Afghanistan and through the joint US-Australia Pine Gap electronic spying facility at Pine Gap, Central Australia, it is complicit in US nuclear terrorism and in targeting illegal US drone strikes in 7 countries, namely Libya, starving Somalia, starving Yemen, Syria, Iraq, Afghanistan and Pakistan) . Australia has a dirty and continuing record of violating the sovereignty of other countries and is thus extremely hypocritical in rushing to judgement and blaming Russia for the Salisbury attempted murder of an individual in the absence of definitive proof. Boris Johnson (UK Foreign Minister) disgracefully agreed with a Labour MP, Ian Austin, who disgustingly compared Putin and the 2018 Football World Cup with Hitler presiding over the 1936 Olympic Games, Johnson stating: “Your characterisation of what is going to happen in Moscow in the World Cup, in all the venues, I think the comparison with 1936 is certainly right. I think it’s an emetic prospect, frankly, to think of Putin glorying in this sporting event” . Comment. Responding to Johnson’s revolting remarks, a spokeswoman for the Russian foreign ministry said: “It is clear he is poisoned with hatred and anger, unprofessionalism and, therefore, boorishness” . Vladimir Yermakov, head of the Russian Foreign Ministry’s non-proliferation and arms control department, said: “Logic suggests that there are only two possible things. 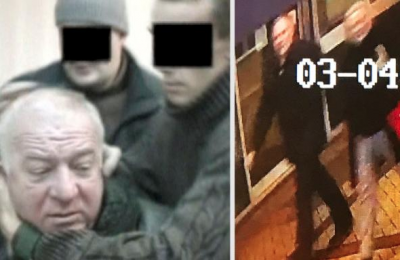 Either the British authorities are not able to provide protection from such a, let’s say, terrorist attack on their soil, or they, whether directly or indirectly – I am not accusing anyone – have orchestrated an attack on a Russian citizen. It is scary to remember that this person represents political leadership of a nuclear power” . Boorish, foot-in-mouth Johnson is a pathetic British analogue of America’s boorish, foot-in-mouth Donald Trump. One notes that 20 million to 27 million citizens of the Soviet Union died in the fight against Hitler’s Nazi Germany whereas the UK and British colonies “officially” lost 450,000 (67,000 civilians) [17, 44]. However generations of mendacious British journalist, politician, commentariat and academic presstitutes ignore that horrible reality that about 90% of British Empire casualties in WW2 were the 6-7 million Indians deliberately starved to death by the British with Australian complicity under mass murder Churchill in the 1942-1945 WW2 Bengali Holocaust (WW2 Indian Holocaust, WW2 Bengal Famine) [27-30]. The Israeli Foreign Ministry opted for a neutral position for whatever strategic reasons, stating: “Israel views with gravity the event which took place in Great Britain and condemns it vigorously. We hope that the international community will cooperate in order to avoid such further events’ . Comment: The official Israeli position is breathtaking hypocrisy and mendacity because genocidally racist Zionists and nuclear terrorist, genocide-based Apartheid Israel have a consistent and sustained record of violation of national sovereignty. Thus the founder of Zionism, racist psychopath Theodor Herzl, toyed with the idea of founding a Jewish State in already largely ethnically cleansed Argentina but plumped for colonizing and ethnically cleansing Palestine, stating: “We shall try to spirit the penniless population across the border by procuring employment for it in the transit countries, while denying it employment in our country” (1895) and “If His Majesty the Sultan were to give us Palestine, we could in return undertake to regulate the whole finances of Turkey. We should there form a portion of a rampart of Europe against Asia, an outpost of civilization as opposed to barbarism” . Indeed there have been about 20 countries around the world proposed as sites for a race-based Jewish State, including my own country Australia . According to fervently Zionist historian Professor Sir Martin Gilbert, the 1917 Balfour Declaration in which degenerate racist and warmonger Arthur Balfour opened the flood-gates to Zionist colonization of Palestine, was actually a ploy to get Russian Zionists to try to keep Russia in WW1 [48, 49]. Of course the ongoing Occupation and ongoing Palestinian Genocide (2 million Palestinian deaths from violence, 0.1 million, or imposed deprivation, 1.9 million, in the last 100 years, 90% of Palestine ethnically cleansed, and 8 million Palestinian refugees) [50-57] is gross, consistent and sustained “violation of national sovereignty”. Indeed, while there are presently 14 million Palestinians, half forbidden to step foot in Palestine, and 50% living under Israeli Apartheid, the racist Zionists go so far as to deny the very actuality of “Palestine” or “Palestinians” e.g. genocidal racist and former Israeli PM Golda Meir (1969): “There is no such thing as a Palestinian people… It is not as if we came and threw them out and took their country. They didn’t exist” . However the racist Zionists have not confined a genocidal agenda to Palestine. Thus nuclear terrorist and genocidally racist Apartheid Israel has been variously involved through arms, advisers and in some instances direct military action in the Rohingya Genocide, the Guatemalan Mayan Indian Genocide, the Iraqi Genocide, the Syrian Genocide, the Sri Lankan Tamil Genocide, the South Sudan Civil War and the ongoing Muslim Holocaust and Muslim Genocide . Apartheid Israel has actually directly militarily attacked 12 countries (Tunisia, Libya, Uganda, Sudan, Egypt, Palestine, Lebanon, Syria, Jordan, Iraq, Turkey and the US) and variously occupied the territory of 5 (Egypt, Palestine, Lebanon, Syria, Jordan, Iraq), this surely being the ultimate in “violation of national sovereignty” . Actual invasion and threat of military attack necessarily divert scarce resources from heath and education to defence, a diversion that is deadly in impoverished countries . Thus 1950-2005 avoidable deaths from deprivation in countries it has occupied in the post-WW2 era total 24 million for nuclear terrorist, serial invader Apartheid Israel . The huge perversion of USA international aid in favour of weapons for Apartheid Israel has massively contributed to the Global Avoidable Mortality Holocaust in which 16 million people die avoidably from deprivation each year . Apartheid Israel is part of a “5 eyes plus 1” intelligence -sharing club. While Apartheid Israel is not formally part of the Anglosphere “5 eyes” intelligence-sharing club (the UK, US, Canada, Australia and New Zealand), the US massively shares “5 eyes” intelligence with Apartheid Israel [58, 59], a huge violation of the national sovereignty of the other countries. It must be noted that the UK, US, Canada, Australia, New Zealand and Apartheid Israel are all based on ethnic cleansing of the Indigenous inhabitants . Since Apartheid Israel’s acquisition of nuclear weapons in circa 1967  , the US and thence the other members of the Anglosphere have become increasingly subverted and perverted by Apartheid Israel and the traitorous Zionist Lobby [60, 61]. While numerous anti-racist Jewish intellectuals are resolutely critical of the ongoing Palestinian Genocide, Western Mainstream Media variously censor or white-wash the nuclear terrorist, genocidally racist, and grossly human rights-abusing conduct of Apartheid Israel. A part explanation for this huge moral discrepancy is that the American 60% of the world’s 30 biggest media companies have a disproportionately high Jewish Board membership and hence a disproportionately high Jewish Zionist Board membership (peace is the only way but silence kills and silence is complicity – both Jewish and non-Jewish Mainstream media Board members and consequently Mainstream media are notoriously silent about the crimes of Apartheid Israel). Jews and females represent 2% and 51%, respectively, of the US population but average 33% and 19%, respectively, of Board members of the top 18 US media companies . In my own country Australia Zionist subversion and perversion are scrupulously ignored by Mainstream presstitutes, notwithstanding the US-approved, Mining Corporation-backed, pro-Zionist-led coup against PM Kevin Rudd in 2010 [63-69]. Traitorous racist Zionists and Apartheid Israel have an appalling record of interfering in the UK’s national sovereignty in particular, notably through violently kidnapping UK citizens in international waters and forging UK passports for state terrorist purposes. It is likely that UK media tycoon Robert Maxwell was murdered by Israeli Mossad . The traitorous Zionist Lobby and Apartheid Israel have an appalling record of false defamation of decent, pro-human rights Labor MPs such as Jeremy Corbyn . Apartheid Israel remains a quite likely perpetrator of the Salisbury attempted murder because it has chemical weapons stocks and refuses to ratify the Chemical Weapons Convention (CWC). Presently 192 states, including US Alliance-maligned Syria, have signed the CWC but genocidal, serial war criminal Apartheid Israel has signed but not ratified it, and Egypt, North Korea and South Sudan have not signed. One notes that chemical weapons have been seen as a “poor man’s weapon of mass destruction” and nuclear terrorist Apartheid Israel has an arsenal of up to 400 nuclear weapons. 5 UN member countries have refused to sign the Nuclear Non-Proliferation Treaty (NPT), of which 4 have nuclear weapons (India, Apartheid Israel, Pakistan and North Korea) ( South Sudan has also not signed). Egypt’s refusal to sign the CWC is directly connected with nuclear terrorist Apartheid Israel’s refusal to sign the NPT [37, 72, 73]. Of course pro-war policies of the Zionist-subverted Anglosphere US Alliance governments has resulted in a massive diversion of funds from health and education to war and terror hysteria. This fiscal perversion is inescapably linked to huge preventable deaths in these countries, largely from personal and national life-style choice causes (e.g. cars, smoking etc). Thus annual preventable deaths from such causes in Australia, Canada, the UK and the US total, 85,000, 101,000, 150,000 and 1.7 million, respectively. Such preventable deaths in Australia, Canada, UK and the US have thus totalled 1.4 million, 1.7 million, 2.5 million, and 28 million, respectively, in the 16.5 years since the US Government’s 9-11 false flag atrocity that is very likely to have involved US Government Zionists and Apartheid Israel [6, 57, 74-81]. Zionist-subverted American Government support for Apartheid Israel in circa 2008 dollars totals about $40 trillion (2013 estimate), the breakdown being (1) $3 trillion in direct aid (1948-2003), (2) $4-6 trillion (Zionist-promoted Iraq and Afghan Wars), (3) $0.7 trillion (Value of a Statistical Life- or VSL-based cost of 88,000 US veteran suicides since September 2001) and (4) about $30 trillion (one quarter of the VSL-based cost of 15.6 million preventable American deaths since September 2001). This is an under-estimate because it does not consider the millions of preventable American deaths before 9-11 linked to Zionist subversion and perversion of America . Such passive mass murder of people is the ultimate in “violation of sovereignty” of the Anglosphere countries. Jeremy Corbyn (Labour Opposition Leader) in response adopted a sane, sensible and honest position that utterly outraged some conservative Labour MPs as well as the mendacious Tories: “An appalling act of violence.. Nerve agents are abominable if used in any war. It is utterly reckless to use them in a civilian environment… I think obviously the government has access to information and intelligence on this matter which others don’t; however, also there’s a history in relation to WMD and intelligence which is problematic to put it mildly. So I think the right approach is to seek the evidence; to follow international treaties, particularly in relation to prohibited chemical weapons, because this was a chemical weapons attack, carried out on British soil. There are procedures that need to be followed in relation to that. “In relation to the second alternative explanation, in other words the loss of control of military-grade nerve agent, we highlighted today and we have done repeatedly, the dangers of mafia-like groups and oligarchic interests in London, and their links with elements within the Russian state, and that we need to take more firm action on that” . Comment: Sensible comments from a truth-seeking, scientific perspective by UK Labour leader Jeremy Corbyn that have inevitably attracted hysterical abuse from representatives of a rotten British Establishment that this century alone has been complicit in the falsehood-driven invasion of Iraq (2.7 million Iraqi deaths from violence or war-imposed deprivation), the ongoing Muslim Holocaust and Muslim Genocide (32 million Muslim deaths from violence, 5 million, or deprivation, 27 million, in 20 countries invaded by the US Alliance since the US Government’s 9-11 false flag atrocity), and of course the ongoing Palestinian Genocide (2 million Palestinian deaths from violence, 0.1 million, or imposed deprivation, 1.9 million, since the British invasion of Palestine in WW1). Comment. We do not know who was responsible for the attempted murder, nor the source of the active agent. The endlessly mendacious UK, US and US Alliance have a long record of using ostensible excuses for military and other hostile actions, notably in recent years in Syria where they have sought with the help of jihadis to remove the Russia- and Iran-supported Assad Government and have repeatedly used the barbarous, US-engendered ISIS and allegations of chemical weapons use to justify military actions in an ongoing Syrian Genocide (0.5 million Syrians killed violently, a similar number dead from imposed deprivation, and 11 million Syrian refugees) . The Skripal attempted murder saga has the stench of an Anglo-American false flag about it but, contrary to Anglo-American assumptions, we simply do not know who was responsible. One recalls the insistent but false Anglo-American assertions of Iraqi possession of Weapons of Mass Destruction (WMD) and the subsequent illegal invasion of Iraq by the US, UK and Australia that killed 2.7 million Iraqis through violence (1.5 million) or war-imposed deprivation (1.2 million) [11, 12]. Indeed one also recalls the related controversial and suspicious death of scientist, Dr David Kelly, who was either murdered by US-UK Intelligence or driven to suicide over his ethical involvement in exposing the WMD lies of the Blair Labour UK Government . Whoever was responsible, the Skripal Affair exposes the degenerate racism and mendacity of Western Mainstream journalist, politician, commentariat and academic presstitutes who bay hysterically over the attempted murder of one individual but resolutely ignore the massive carnage of 32 million Muslims dead so far in the ongoing Muslim Holocaust and Muslim Genocide in the Zionist-promoted, US-led War on Muslims . Peace is the only way but silence kills and silence is complicity. Decent people around the world are obliged to (a) inform everyone they can and (b) urge and apply Boycotts, Divestment and Sanctions (BDS) against all people, politicians, corporations and countries complicit in the Muslim Holocaust.
. “Porton Down”, Wikipedia: https://en.wikipedia.org/wiki/Porton_Down .
. Gideon Polya, “Biochemical Targets of Plant Bioactive Compounds: A Pharmacological Reference Guide to Sites of Action and Biological Effects”, 860 pages, Taylor & Francis/ CRC Press, London and New York, 2003.
. “Fragmentation (mass spectrometry)”, Wikipedia: https://en.wikipedia.org/wiki/Fragmentation_(mass_spectrometry) .
. James Masters, “Theresa May’s full statement on Russian spy’s poisoning”, CNN, 13 March 2018: https://edition.cnn.com/2018/03/13/europe/theresa-may-russia-spy-speech-intl/index.html .
. “UK drone strike stats”, Drone Wars UK: https://dronewars.net/uk-drone-strike-list-2/ .
. Gavin Fernando, “Britain, France, Germany and the US have issued a joint statement condemning Russia”, News.com, 16 March 2018: http://www.news.com.au/finance/economy/world-economy/britain-germany-france-and-the-us-have-issued-a-joint-statement-condemning-russia/news-story/47324318663ea4add973ed20083da727 .
. Gideon Polya, “Fundamentalist America Has Trashed Secular Governance, Modernity, Democracy, Women’s Rights And Children’s Rights In The Muslim World”, Countercurrents, 21 May, 2015: https://www.countercurrents.org/polya210515.htm .
. David Vine, “Where in the world is the US military”, Politico, July/August 2015: https://www.politico.com/magazine/story/2015/06/us-military-bases-around-the-world-119321 .
. Gideon Polya, “Proven US Alliance Lying Over Chemical Weapons Attack & Trump Pretext For Destruction Of Syria”, Countercurrents, 12 April 2017: https://countercurrents.org/2017/04/12/proven-us-alliance-lying-over-chemical-weapons-attack-trump-pretext-for-destruction-of-syria/ .
. “EU statement on Skripal case speculative and unsubstantiated – Moscow”, Sputnik, 19 March 2018: https://sputniknews.com/europe/201803191062683673-sweden-eu-russia-measures-skripal/ .
. “European Union”: https://europa.eu/european-union/about-eu/countries_en .
. Adam Bienkov, “Trump says he will wait for the “facts” on Sergei Skripal poisoning before condemning Russia”, Business Insider, 14 March 2918: https://www.businessinsider.com.au/trump-condemn-russia-or-whoever-for-sergei-skripal-poisoning-2018-3?r=US&IR=T .
. Anna Henderson and Stephanie Dalzell, “Russia must bear responsibility for chemical weapon attack on former spy, Julie Bishop says”, ABC News, 18 March 2018: http://www.abc.net.au/news/2018-03-18/australia-meets-with-russia-over-ex-spy-poisoning/9560102 .
. “Boris Johnson says Vladimir Putin will use World Cup like Hitler used Olympics to bolster image”, ABC Mew, 22 March 2018: http://www.abc.net.au/news/2018-03-22/boris-johnson-compares-putins-world-cup-to-hitlers-olympics/9574726 .
. Lizzy Buchan, “Boris Johnson compares Putin and Russia World Cup to Hitler hosting the 1936 Olympics”, Independent, 22 March 2018: https://www.independent.co.uk/news/uk/politics/boris-johnson-putin-russia-world-cup-hitler-olympics-1936-comparison-a8266891.html .
. Israeli Foreign Ministry Tweet, 16 March 2018: https://twitter.com/IsraelMFA/status/974331050187993088 .
. Gideon Polya, “50 Ways Australian Intelligence Spies On Australia And The World For UK , Israeli And US State Terrorism”, Countercurrents, 11 December, 2013: https://www.countercurrents.org/polya111213.htm .
. Gordon Thomas. “Gideon’s Spies. The Secret History of the Mossad”, Pan , London, 1999.
. “Antisemitism in the Labour Party”, Wikipedia: https://en.wikipedia.org/wiki/Antisemitism_in_the_Labour_Party .
. “Israel and weapons of mass destruction”, Wikipedia: https://en.wikipedia.org/wiki/Israel_and_weapons_of_mass_destruction .
. Gideon Polya, “Canadian academic: “F— neoliberalism”, MWC News, 14 May 2016: http://mwcnews.net/focus/analysis/58847-f-neoliberalism.html .
. Gideon Polya, “Corporate terrorism is state sanctioned, kills over 30 million people annually and dooms humanity by lying”, State crime and non-state terrorism: https://sites.google.com/site/statecrimeandnonstateterrorism/corporate-terrorism .
. Gideon Polya, “Save Humanity And The Biosphere Through Zero Tolerance For Deadly Neoliberalism And Remorseless Neoliberals”, Countercurrents, 13 May, 2016: https://www.countercurrents.org/polya130516.htm .
. Heather Stewart, “Corbyn under fire from own MPs over response to PM’s Russia statement”, The Guardian, 15 March 2018: https://www.theguardian.com/uk-news/2018/mar/14/jeremy-corbyn-under-fire-over-response-to-pms-russia-statement .
. “David Kelly (weapons expert)”, Wikipedia: https://en.wikipedia.org/wiki/David_Kelly_(weapons_expert) .